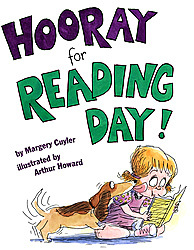 Hooray for Reading Day by Marjery Cuyler takes its cue from the growing popularity of the use of R.E.A.D. (Reading Education Assistance dogs) with slow readers. Children reading to dogs have been proven to reduce anxiety levels in challenged readers and provide low-pressure help which is safe, non-judgemental and fun. When Jessica tries to read aloud in class, she stumbles over the words and everyone laughs. The upcoming Reading Theater day has Jessica extremely anxious. What if she makes a mistake in front of all the parents? Jessica’s mom tries to reassures her when she admits that she was the slowest reader in first grade till “one day everything clicked.” Jessica retreats under a blanket with Wiggles(Jessica’s dog) as she reads to Wiggles for the big day. Wiggles encourages Jessica with doggy kisses . When it’s Jessica’s turn to read in front of her classmates and their parents, Jessica pretends that she is reading under her blanket with Wiggles and all goes well. R.E.A.D(Reading Education Assistance dogs) Program is run through Intermountain Therapy Animals whose mission is to “improve the literacy skills of children through the assistance of registered therapy teams as literacy mentors.” Learning to read can be stressful for children, so the R.E.A.D. (Reading Education Assistance Dogs) are specially trained for this program, which offers a relaxed, comfortable, safe, nonjudgmental and fun atmosphere while the child develops confidence when he or she picks up a book. R.E.A.D. is also an official partner with “Angel on a Leash,” the Westminster Kennel Club’s Charity(the dog therapy branch of Westminster Kennel Club). R.E.A.D. (Reading Education Assistance Dogs) Program has also been chosen to be a national educational outreach partner with PBS. Simon and Schuster will be sending R.E.A.D. copies of Hooray for Reading Day! (Jessica Worries) to distribute to hundreds of registered R.E.A.D. teams throughout the United States and Canada.